Discussion: Many of us understand that radars are used to monitor hydro-meteorological phenomena, whether that be rain, snow, hail, and anywhere in between. However, radars do not just focus on capturing weather. 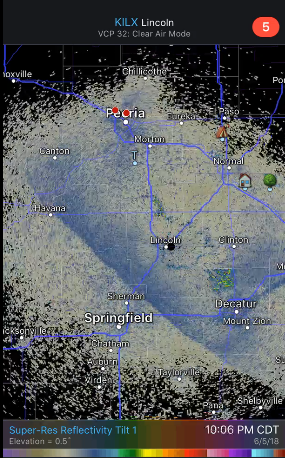 Anything that flies into the range of the radar beam can appear as reflectivity. 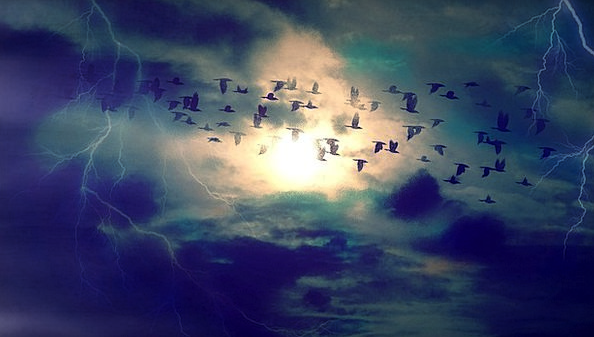 Migratory birds are one non-meteorological feature that are commonly seen on radar. A small group of birds on radar can show up as what appears to be small rain showers whereas large migratory groups are visualized as a larger mass of light to potentially moderate rain. There are other radar parameters that can be used to decipher actual rain showers from birds such as correlation coefficient (a measure of how uniform the object being observed is) where typical numbers at or below 0.8 are common for birds with rain closer to 1. ​Here is an example of birds on radar migrating from Cuba to Key West, FL. The returns on the radar are close to 5-10 dBZ perhaps around a few lower teens in a few spots. This relates to a light to perhaps nearing a low-end moderate migration. The radar reflectivity correlation to the size classification of a migration is according to Gauthreaux et al. (1999) and stated on birdcast.info/research/review/. As mentioned before, typical correlation coefficient values around 0.8 and below relate to objects other than rain. As seen above the cc values are near 0.8-0.9 and lower in some areas signifying a migration of birds from Cuba to Key West, Florida. There are different weather factors that can trigger a bird migration. The major assisting factor is the wind direction and speed. Birds favor a tailwind regardless of the time of the year. During the spring migration, when birds are traveling north across the United States, a southerly flow is preferable. 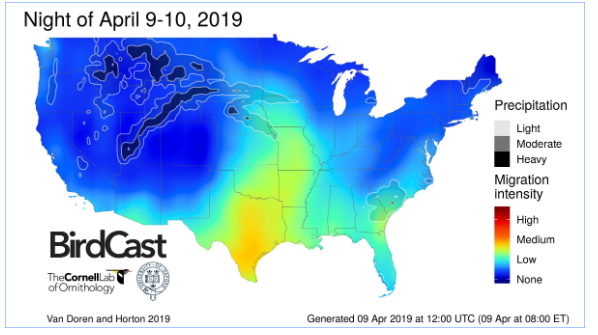 The forecast from the website birdcast.info shown above (this website has other information including a live map) the night of April 9th into the 10th features a sizeable migration from Texas on northward into the Mississippi Valley. 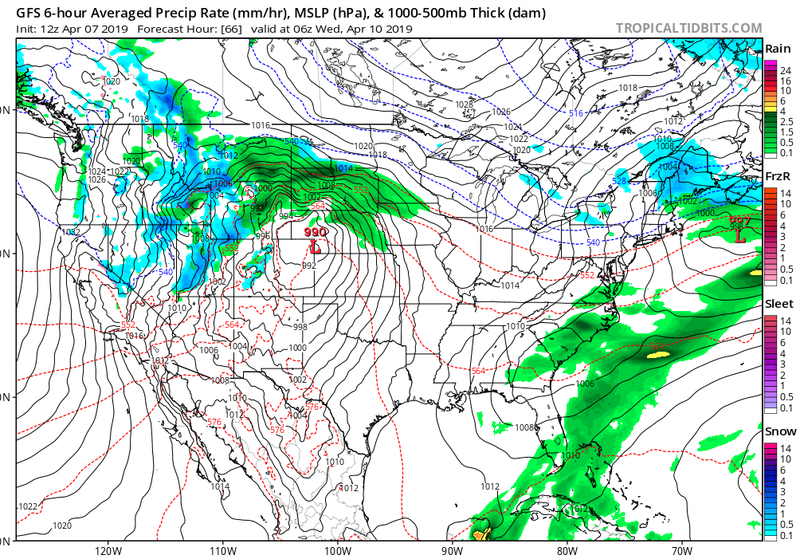 The GFS MSLP forecast image for 06Z April 10th (below), during the nighttime hours, shows a strong low pressure across the central High Plains. Notice the similarities between the forecast medium migration region and where the pressure gradient (tight, packed close together lines running southwest to northeast) aka relatively strong southerly winds reside (Texas, Oklahoma, into the Mississippi Valley). This tailwind will trigger a low and in portions a medium migration according to the forecast. ​Precipitation can act as a limiting factor. This is where uncertainty develops when forecasting migration. On the previous Birdcast image, the precipitation is outlined over the forecast. The site mentions where precipitation and favorable migration conditions coexist, variability and significant unknowns are present in the forecast. Above, a “flying eagle” supercell typically known as a V-Notch. The shape looks like an eagle with the wings pointed upwards. Image courtesy of @tornadotrackers via radarscope. Radar imagery valid June 19, 2018. 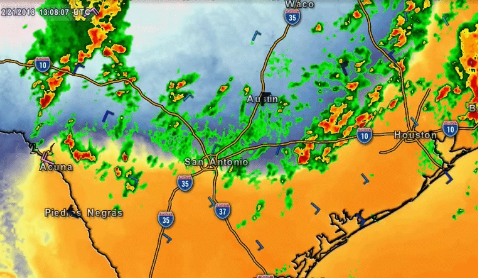 On a loosely related note, there is a type of supercell that looks like a bird on radar. The image above shows a strong supercell thunderstorm with a configuration on radar that is typically known as a V-Notch or “Flying Eagle”. This is typically present with the strongest and tallest updrafts. 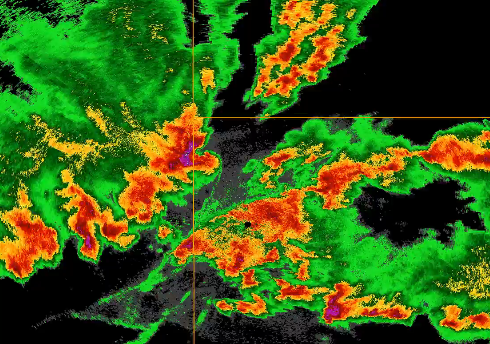 Radar has great application to not only detecting powerful and dangerous supercells like the one shown above but other important features such as bird migratory patterns. To learn more about North American weather, how it impacts wildlife, and everywhere in-between, be sure to visit GWCC by clicking here! Some Insights into the Impressive Radar Appearance the April 2nd Nor'easter. DISCUSSION: As far as low-pressure systems go, there is little to no doubt that the 2 April 2019 Nor’easter will go down in history as one of the more impressive coastal storms of all-time. Despite the fact the worst of the impacts remained just offshore, this storm system still most certainly “strutted its stuff.” More specifically, as the developing storm system underwent a period of rapid intensification, there were successive rounds of impressively intense convection which consequently developed both just offshore and along the immediate coastal regions of North Carolina. Even with the storm being as intense as it was becoming during the evening hours of 2 April, there was still somewhat of a “gift” to the immediate coastal regions based on the fact that the majority of the system’s core circulation remained just offshore. 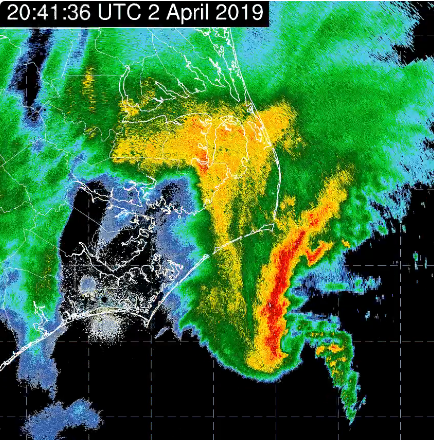 Thus, as a result of the bulk of the most intense part of the rapidly intensifying low-pressure system remaining just offshore from coastal North Carolina, the strongest winds, largest waves, and the heaviest rainfall also remained offshore for much of the night. However, even with the worst of the nor’easter remaining just offshore, there was still very substantial and impressive convection offshore during the evening and late evening hours as shown above (courtesy of imagery provided by Mark Nissenbaum). As the convection continued to intensify with time (as shown above), you can also see how the deepest convection also gradually experienced a “curling effect” in a cyclonic fashion in accordance with the corresponding wrap-up of this extra-tropical cyclone. This became even more impressive with time since as the storm intensified and wrapped up (or deepened in other words) with time, the core part of the system’s circulation took on an appearance that what somewhat resembled a supercell thunderstorm at certain points. To be clear, supercell thunderstorms are more typically Spring and Summer-time convective storm types which form most often across the U.S. Plains states. This just goes to show that even a large low-pressure system such as a nor’easter can take on appearances akin to much smaller mesoscale atmospheric phenomena if the atmospheric dynamics are truly profound and come together just right. To learn more about other interesting and high-impact weather events occurring across North America, click here! 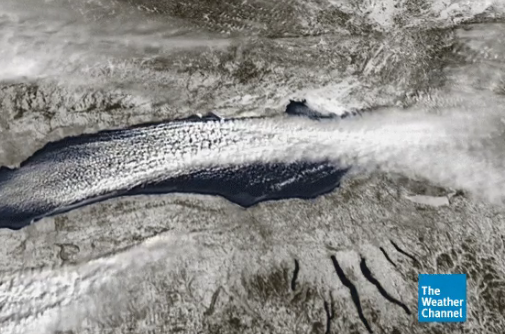 Diving Deeper into the Dynamics of Lake Effect Snow During the Recent Polar Vortex Visit. DISCUSSION: It is the heart of a true Arctic air intrusion and the only thing which most people are thinking about are the implications of the cold weather on how they will dress or what sort of social life they will likely plan during the extent of a given cold weather stint. However, there are several other atmospheric phenomena which can unfold during various parts of a cold air outbreak. One such example occurs when a very cold air mass moves over a relatively warmer lake, bay, or ocean surface. As this colder air moves over the warm body of water of some variable size, the cold air is modified and undergoes a reasonable degree of destabilization which sometimes leads to the development of shallower convection in the form of lake effect snow (i.e., when the shallower ocean, bay, or lake-driven convection is sufficiently organized). This Winter-time atmospheric phenomenon is most common during the Winter-time months across various parts of North America and Europe if there is a sufficiently low amount of lake, sea, or ocean-based ice coverage present. The reason for why minimal ice coverage is a critical factor involved with lake effect snow is a result of the fact that substantial ice coverage will prevent the essential surface fluxing (i.e., the process of warmer water vapor being released from the warmer water body surface) from occurring. In the case of this past week across the full extent of Lake Ontario (and even Lake Erie for the most part), this was very far from the situation at hand. More specifically, as the heart of the coldest air associated with the brief visit from the “Polar Vortex” circulation moved over and across the Great Lakes region (and particularly across the extents of Lake Erie and Lake Ontario), this triggered a substantial lake response off Lake Erie and a truly prolific response off Lake Ontario. In the brief animated gif attached above (courtesy of Meteorologist Tom Niziol from The Weather Channel in Atlanta, Georgia), you can clearly see how the full extent of Lake Ontario exhibited a classic long-lake axis parallel (LLAP) response to the severely cold air mass traversing across the full extent of the lake (Steiger et al. 2013). As a result of this incredibly efficient lake response, this allowed a truly EPIC lake effect snow band to develop and maintain itself over a long period of time with relatively minimal movement from a north-to-south perspective. 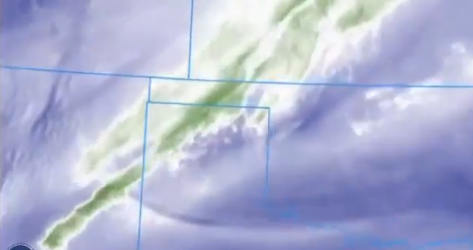 In addition, in the latter part of this gif, you can also see this recent lake effect snow band from a three-dimensional perspective near the peak of its existence. Note how you can also see the clear gradual intensification of the shallowed lake-based convective cells which developed (per the growing blue-colored “puff-shaped” figures which were moving towards the eastern shoreline of Lake Ontario back on 31 January. Furthermore, you can also see how the blue-colored cells darkened somewhat as they approached the eastern shoreline which indicated that further intensification of the lake effect convection was occurring in earnest (i.e., leading to heavier snowfall occurring along and just east of Lake Ontario’s easternmost sections). 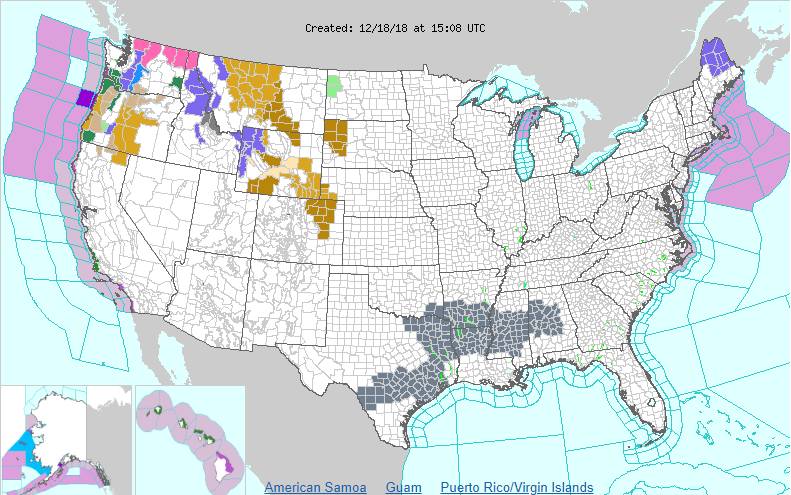 To learn more about other interesting weather topics occurring across North America, click here! References: Steiger, S., Schrom, R., Stamm, A., Ruth, D., Jaszka, K., Kress, T., Rathbun, B., Frame, J., Wurman, J. and Kosiba, K. (2013). Circulations, Bounded Weak Echo Regions, and Horizontal Vortices Observed within Long-Lake-Axis-Parallel–Lake-Effect Storms by the Doppler on Wheels*. Monthly Weather Review, 141(8), pp.2821-2840. DISCUSSION: As 2018 draws to a close, so does the first quarter of the water year for Northern California. The water year begins on October 1 and ends on September 30 as set by the United States Geological Survey (USGS) in order to accurately take account of snow that would fall in autumn and winter and not melt until the following summer. So far, across much of Northern California, the amount of precipitation has been below average to date. A very dry October across much of Northern California has been one of the biggest factors in the below-average rainfall total in the region. In fact, much of the rain that has fallen was early in the month due to a flow of monsoon moisture that reached the San Francisco Bay Area bringing only a few hundredths of precipitation to areas including San Jose and Oakland while not producing any rain in the areas that usually get more such as Napa. The very dry October came as a result of several persistent high-pressure ridges which kept much of the storms from the Gulf of Alaska away from Northern California and steered them towards Oregon and Washington. November began the same way October ended with very dry conditions dominating for most of the month until the day before Thanksgiving, when the first storm from Alaska moved in. This was the first storm in a series which came through for a few days until the end of the month. The storms had brought enough rain to Northern California to help reduce nearly all the deficit from the dry October and even in some places finished above average for the season. However, the Crescent City area near the border of Oregon finished with another below average month which increased its deficits while the other more northern coastal areas like Ukiah and Eureka finished above average. In addition, the precipitation that came at the end of the month was instrumental in helping with the containment of the Camp Fire as well as clearing out the smoke from the Bay Area. December started with the last of the storms from November before having storms come in at a period of once a week. However, these storms produced about the same as November, but it was below average as December is a wetter month for Northern California. Northern California typically gets most of its rain in December through February as the jet stream which helps with the movement of storms is positioned further south. However, this year, the storm track has not moved as far south due to high pressure ridges that lasted longer in between the storm systems. It is only the first quarter of the water year and the months with the typical heaviest rainfall are yet to come for Northern California. 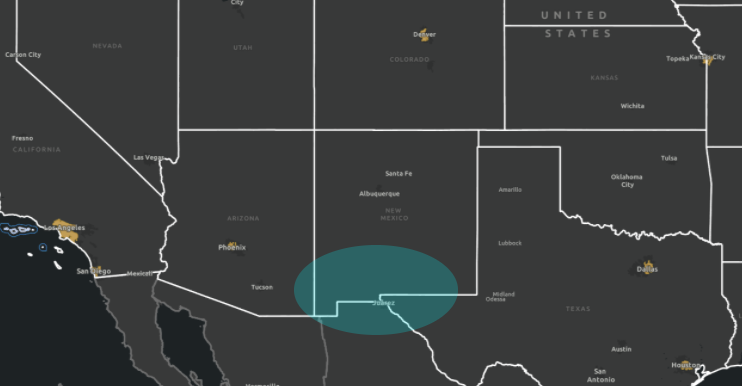 To learn more about other high-impact weather events from across North America, be sure to click https://www.globalweatherclimatecenter.com/north-america ! California A Leader in Curbing Emissions, So Why the Poor Air Quality? California is a world leader in the fight against climate change and harmful polluting emissions, due to a surplus of cutting edge, bold laws put into place by CA governor Jerry Brown. With the signing of SB 100 this past September that commits the state to 100% clean energy by 2045, and the executive order B-55-18 that commits the states entire economy to complete carbon neutrality by 2045, one would think the pollution in California to be quite low in comparison to other states. However, this is not the case as the American Lung Association rated Sacramento the 5th worst city in the nation for ozone pollution. A quick visit to their website, lung.org, reveals that many other prominent CA cities such as Bakersfield, Los Angeles, Modesto, Fresno, and Visalia to be in the top ten worst polluted cities in the US for both short-term and year-round particle pollution. So why does CA, despite its efforts to curb energy and industrial emissions, rank so poorly for air pollution? Much of the problem has to do with California’s topography. Cities situated in the valley, such as Modesto, Bakersfield, Fresno, Visalia, and Sacramento, are surrounded by mountain ranges like the Sierra Nevadas, the Cascades, Coastal, Klamath, and Transverse. The mountains work as a bowl, in which air is trapped and sits, and little to no air circulation occurs. Here, pollution continually accumulates and compounds bringing it up to unhealthy levels. The problem is then exacerbated in winter as temperature inversions occur, trapping cold stagnant air below a layer of warmer air in which pollutants have no chance to be “vented” out as they might during the summer, thanks to the physical property of heat rising. Another factor in this excessive pollution has been the increase in population throughout California, especially the central valley. This has led to an increase in cars, most of which run off gasoline or diesel combustion engines. These vehicles emit harsh pollutants such as volatile organic compounds, nitrous oxide, carbon monoxide, sulfur dioxide and more. In warmer temperatures, such as the summertime months, some of these pollutants are involved in a series of chemical reactions involving sunlight in which they are transformed into ozone, an extremely corrosive and dangerous pollutant that can cause chest pain, coughing, throat irritation, or even worsen the condition of those with chronic respiratory illnesses such as asthma. These issues are especially common in the more central valley of California. The California central valley, home to cities such as Visalia, Modesto, and Fresno, is one of the most productive agricultural regions throughout the state. Alongside quantities emitted by enormous amounts of diesel guzzling and polluting farm equipment, more pollution occurs when crops are burned at the end of the season, typically in fall, to prepare the land for the next year’s crop. However, aside from the smoke that the burning produces, it leaves another pollution source in its wake, long after the flames and ash have died down: bare soil. In particularly dry and drought-stricken years, wind seamlessly picks up loose soil and dirt, and disseminates the tiny dust and dirt particles throughout the air, adding to the particulate matter. Often this occurs in winter when fields are bare and or left to fallow, as there exists no crop roots to hold down and compact soil. With no rain, soil is parched and easily moved about, pollutants hover and compact in the atmosphere, and residents using wood-burning stoves and fireplaces only exponentiate the issue. 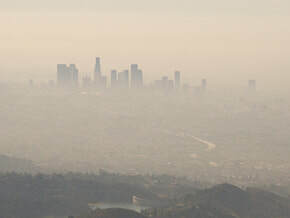 With these multiple sources and traps of pollution, it’s no wonder that California has such horrid pollution, enough to classify it as the worst in the United States. Many measures have been passed in order to curb and control these emissions, at least from industry, but it is not nearly enough. Change cannot be made to the California topography. So, it is advisable that going forward, not only industry, but residents take action as well to help reduce these harmful pollutants. Be it switching from gas guzzlers to electric vehicles, replacing wood burning fireplaces for natural gas or electric, or simply using less energy, there is much that can be done to reduce toxic pollution and emissions. Discussion: Portions of north-central Montana from time to time experience high wind events. Typically winds downslope off the Northern Rockies creating these downslope wind storms which are high impact events for motorists, pilots, etc. The setup for December 18th-19th showed signs of such an event and prompted high wind warnings by the NWS (light gold color) across a large section of central Montana. This article will examine a way to predict strong downslope winds. 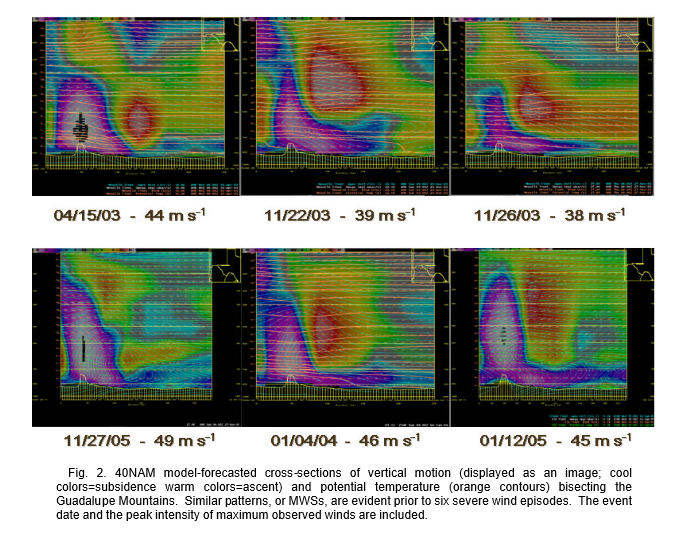 This image above is from the article “An Operational Technique Used to Detect ‘Mountain Wave Signatures’: A Forecast Methodology for Severe Westerly Winds in the Mountains of West Texas” by Todd and Coty Lindley, and Jeffrey Cupo, NWS WFO Lubbock, Midland, TX. One method to forecast a potential downslope wind storm is to take a cross section of the atmosphere perpendicular to the mountain range and analyze the vertical motions present. Based on the article referenced above the vertical cross section should display strong descending air coupled with weaker ascending air just downwind of the mountain peak with an upwind tilt with height. The image above is a cross section down in Texas through the Guadalupe Mountains, notice the upward and downward vertical motions with an upwind tilt in each event with the surface gusts noted below each image. The cross section starts at point A and runs northeast to point B. Downward vertical motion is represented in grays and whites, upward in pinks. Winds are plotted, equivalent potential temperature, as well as relative humidity. The terrain and elevation are plotted on the bottom of the image with the associated pressure level on the left-hand side. 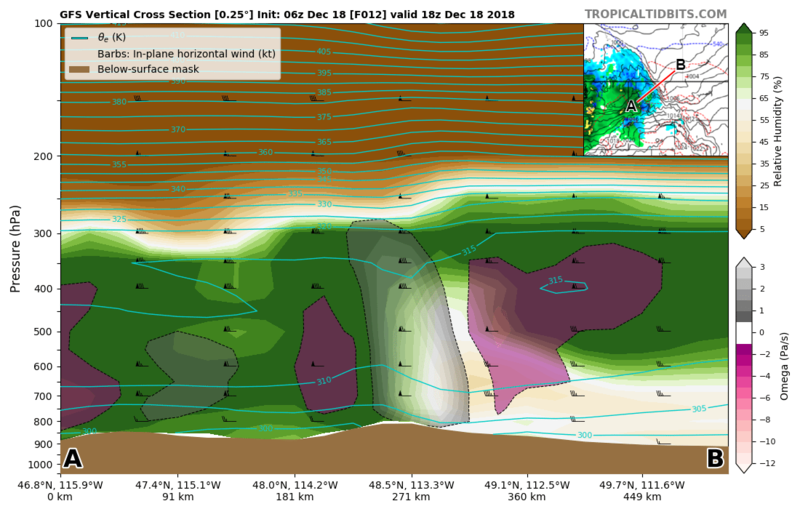 Luckily, tropicaltidbits.com has a function to create cross sections. This cross section is produced from the GFS at 18Z on the 18th (location marked in the upper right corner point A to point B. Right after the start time of the high wind warning the coupled strong downward and upward vertical motion downwind of the highest terrain shows up in the model in a similar fashion to the previous example. What did the actual wind observations read during this downsloping windstorm? Attached below are the observations from Blackfeet, MT. 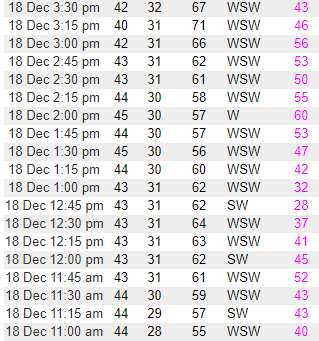 Surface winds gusted (purple numbers on the right-hand side) into the 40s around 11AM local time, 18Z, with gusts into the 40s and 50s over the next few hours and even a 60-mph reading at 2PM local, 21Z. The setup for downsloping winds also create conditions that result in mountain waves. Not only are the strong surface gusts hazardous to trucks and other vehicles on the roadways but mountain waves are extremely turbulent and dangerous for aircraft aloft. To learn more about high wind events and North American weather in general click here! Insights Behind the Heavier Snow Burst Expected Across Southern Connecticut Tomorrow. DISCUSSION: There is increasing confidence of there being a short but intense burst of heavier snow across both the Hudson Valley in southern New York state as well as across parts of southern Connecticut during the day tomorrow. This is going to most certainly induce substantial travel delays as this heavier snowfall burst moves through these parts of the Northeastern United States. However, it is also important to understand how and why this burst of heavier snowfall is projected to unfold in the first place. To understand this, it is important to explain to explain a fundamental concept which is directly tied to heavy snow banding within Winter-time coastal low-pressure systems. This critical process which is directly associated with heavier snow banding which forms in association with heavier snow banding features within Winter-time coastal low-pressure systems (which are also referred to as Nor’easters) is known as frontogenesis. Frontogenesis in the simplest terms is essentially the process by which air-streams in the lower-to-middle parts of the atmosphere converge from opposite directions which forces locally-driven upward motion. When this regionally forced upward motion occurs along a horizontal axis in the vicinity of a coastal or semi-coastal region along a region such as the U.S. East Coast, this will often facilitate the generation of features known as mesoscale snow bands. Mesoscale snow bands are often longer and relatively narrower snow bands which form within larger precipitation (i.e., mostly snow) shields within a Nor’easter and are directly fueled by the low/middle-level convergence associated with strengthened low-level frontogenesis. Thus, the frontogenetic forcing is the primary ingredient which when combined with sufficiently colder air, leads to locally heavier snowfall potential. Attached above is a recent graphic (courtesy of the Tropical Tidbits website which is directed by Meteorologist Levi Cowan) which perfectly illustrates this concept via the forecast for the North American Model (NAM)-12km 700 hectopascal Temperature (in degrees Celsius), Temperature Advection, Frontogenesis, and Wind for the next 24 to 36 hours. You will note how there is a brighter red-colored band which moves through a good portion of Connecticut and the lower Hudson Valley tomorrow which is the frontogenetic feature which is projected to generate this heavier snow band. Thus, it will certainly be interesting to watch and see how this winter weather event unfolds for these areas and beyond. Be sure to stay tuned with us right here at the Global Weather and Climate Center website and on Twitter as well as Facebook for the latest updates! DISCUSSION: Autumn officially began September 22nd and ends on December 21st 2018 in the Northern Hemisphere. Fall marks the transition from summer to winter, a time when many changes are evident in the Northern Hemisphere. However some of these transformations aren’t always apparent in the Northern Hemisphere as other locations, take for example the 50th state, Hawaii. 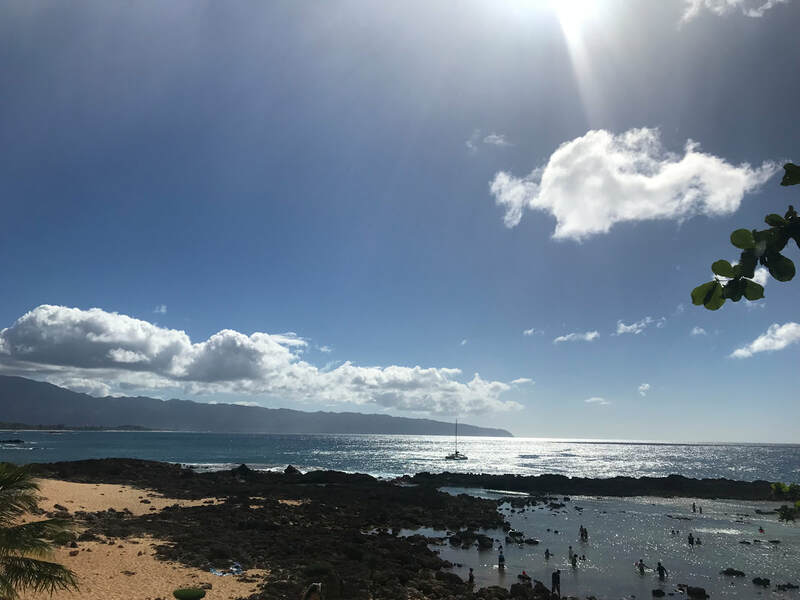 Hawaii does not observe daylight saving time, despite this there is a decrease in duration of daylight, making early morning commutes and evening commutes more challenging as drivers are now back to using headlights. The amount of daylight observed is dependent on several factors: latitude and Earths orbit around the sun, as the Earth’s axis is tilted, the orientation to the sun is always changing throughout the year, thus a change in distribution of sunlight on the Earth’s surface as a specific latitude. Timeanddate.com is a simple site designed to provide information on sunrise, sunset and day length based on location. For example if we input Honolulu, HI on October 18th 2018, Sunrise is 6:28am and Sunset at 6:04pm, providing approximately 11:36 of daylight. Whereas New York, NY, experiences a sunrise at 7:10am and sunset at 6:10pm for a total daylight of 11:01. In addition to differences in daylight and times observed for such, temperatures trend on the decreased side of the spectrum as tilt moves away from the sun in the Northern Hemisphere. 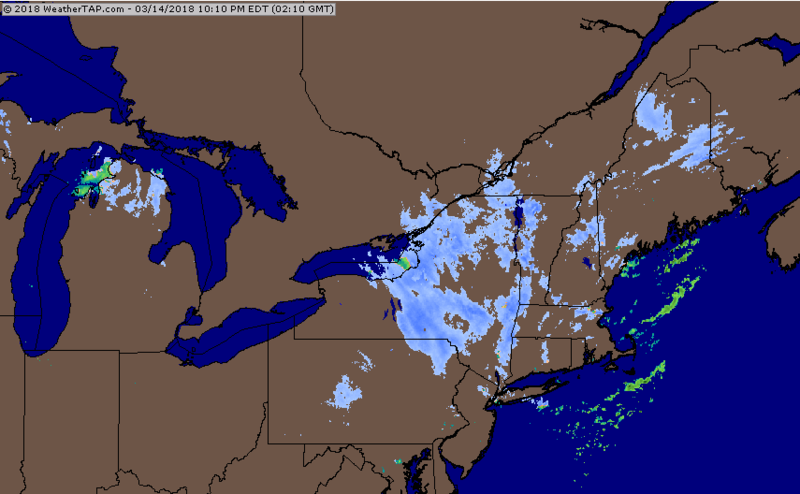 This has seemingly brought early snows to places like Wichita KS, Woodstock VT, and even Cortland (Central) NY! This is a time where fall foliage is peak in upstate New York, central Colorado and parts of northern Wisconsin. As we near mid-November more than half of CONUS is past peak, experiencing cooler weather despite the possibilities for tropical development near the Lesser Antilles, as we still are reminded it is still hurricane season in the Atlantic until the 30th. Crop harvesting is apparent for nearly every state in the U.S. Some often fall harvest vegetables are beets, beans, turnips, green onions and of course apples and pumpkins. These being heavily popular among families looking for great activities during the fall transition period. Hawaii seeing some different harvests as the fall season is well underway, such as various avocados 9often available different times of the year), apple bananas, cabbage and carrots often harvested year-round, limes, oranges an so much more. With Hawaii home to nearly 11 of the 13 climate zones in the world, it is a great environment to grow a variety of fruits and vegetables and use a great deal of these seasonally to supplement any meal! Lastly, the transition of summer to fall signals the time for advanced surfers to pull out the boards for big-wave surf. During this seasonal progression, winds can increase, humidity decrease with an increase in swell height. Often we see the swell increase on north and west facing shores throughout the island chain, marking a time for World Surf League events such as the Vans Triple Crown, Beachwaver Maui Pro, Billabong Pipe Masters and more! Autumn is a great season to see some of these changes occur despite the lack of foliage change in Hawaii. It is an opportune time to view many big-wave events, try seasonal fruits and vegetables, and maybe spot a stray whale coming in for the winter season. For information on fall changes in Hawaii or CONUS visit the Global Weather and Climate Center! 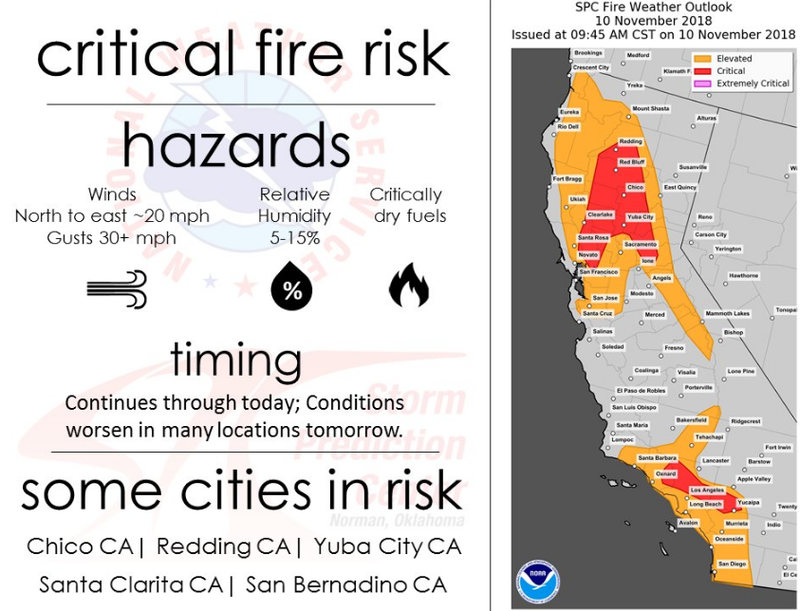 DISCUSSION: As the fire weather threat across many different parts of California continue to evolve with time, there is no doubt that many people who have either been impacted already or may be soon have more concerns still. Having said that, it is imperative to establish the fact that there are still major fire weather concerns across the state of California. Even after considering the ongoing threat from the Camp Fire, the Hill Fire, and the Woolsey Fire, there are still major wildfire conditions across the state of California and are explained in the short video briefing attached above. 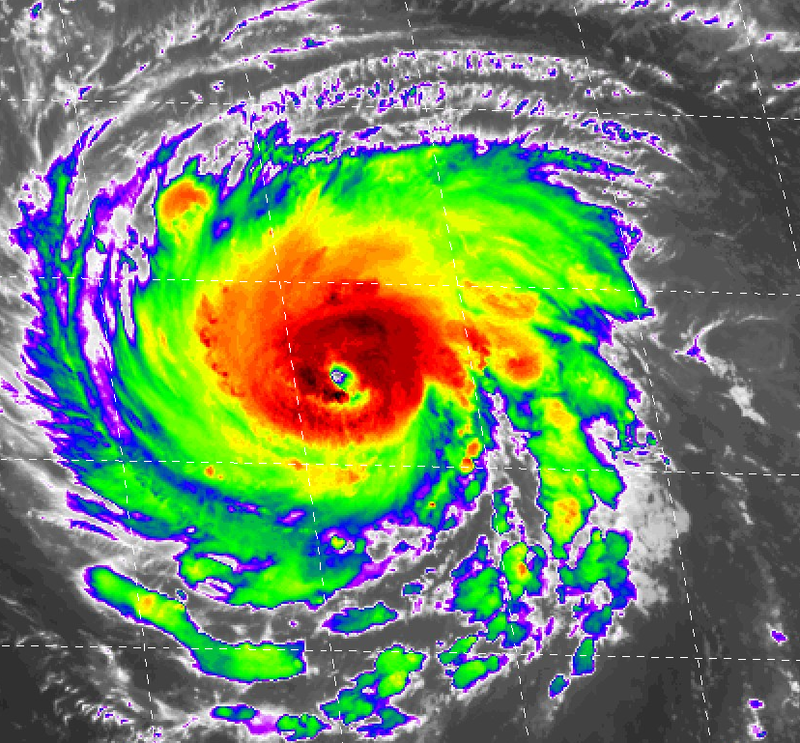 DISCUSSION: As of earlier this evening, many people along the mid-Atlantic coastline along the East Coast of the United States were likely breathing a slight sigh of relief when they heard that the recent period of rapid intensification which had unfolded in association with Hurricane Florence had finally come to at least a temporary end. The reason for this temporary break in this latest round of rapid intensification with Florence could have been due to any number of different sensitive storm-relative factors. However, the most likely culprit for this brief respire in the more rapid intensification of Florence would be what is referred to as an eye wall replacement cycle. When it comes to dealing with more intense tropical cyclones, there are quite often very unpredictable and relatively frequent changes in intensity regardless of how subtle they may be. These brief periods wherein a tropical cyclone is temporarily halting further intensification may be seen by the general public as a good sign that the storm has finally reached its peak intensity. However, this unfortunately cannot be farther from the actual truth. In reality, this is in all likelihood just a brief "break" from the storm potentially undergoing even further intensification which may take it closer to a Category 5 hurricane depending on much deeper the actual low-pressure system gets down to at the core of the tropical cyclone. Therefore, there are some major considerations to make NOW and TAKE ACTION in response to. First and foremost, if you are in any coastal sections of South Carolina, North Carolina, and/or Virginia, you will DEFINITELY want to consider making a full and complete evacuation from your residence since it will simply be unsafe for you to remain in such a location as Hurricane Florence make its final approach. Moreover, even if you are further inland, you will also want to make strong preparations as well since inland areas of these states and beyond will also more than likely experience heavy rainfall as well as gusty, tropical-storm force winds. Thus, with there still being a solid 48 to 60 hours left prior to the onset of the first impacts from Hurricane Florence across at least those 3 states noted above, there is still time to make corresponding plans for what to do and where to go as regional highways will all be directed out of major coastal cities as of tomorrow morning in locations with the currently projected "strike zone" of Florence. Finally, even if you happen to be located beyond the immediate coastal evacuations, once again you are not "out of the woods" from Florence and you should take this INCREDIBLY seriously as there will likely be tremendous flooding from this upcoming hurricane landfall even 50 to 60 + miles from the immediate coastline. 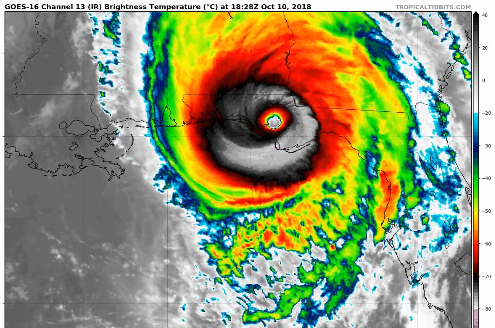 For more updates be sure to look at updates from your local National Weather Service office, from the National Hurricane Center, and from right here at the Global Weather and Climate Center! The Mid-Atlantic states have been in a period of cooler weather since the beginning of March. While April did have a few warm days, the warmer temperatures did not last and sunk back into the 50’s and even 40’s. This week, however, temperatures are expected to near 90ºF by Thursday. While Sunday will be the coolest day, the forecasted high temperatures will continue to rise until after Friday. The weekend is expected to be nice with temperatures hanging in the 70’s. 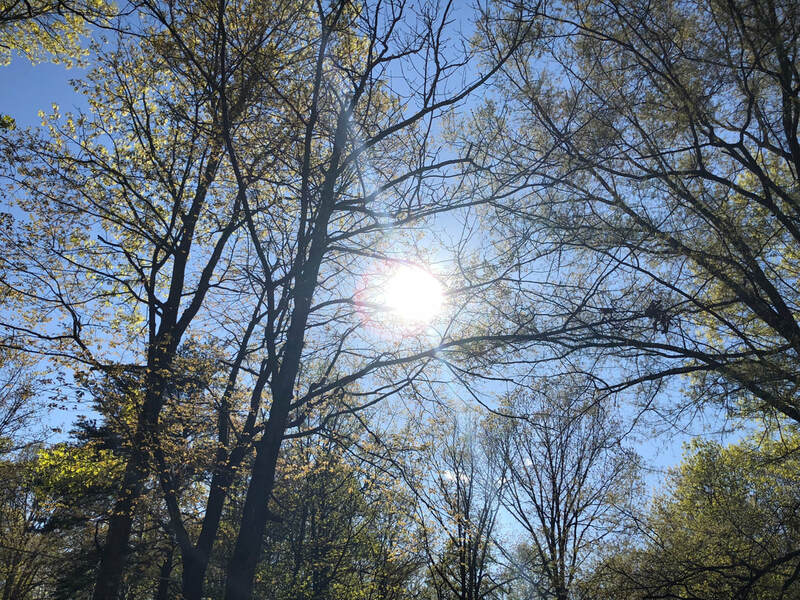 To put this into perspective, the average temperature for the month of April is 70ºF while the average temperature for the month of May is 78ºF. A low pressure that is currently sitting over the New England states is the culprit for bringing the cooler temperatures and windy conditions to the Mid-Atlantic states on Sunday. The low pressure is expected to move off of the coast by tonight which will allow the warmer temperatures from a high pressure (that will be centered to the southeast of the region). High pressures rotate clockwise in the Northern Hemisphere, so this high pressure will grab ahold of the warmer temperatures near the Gulf of Mexico and push them northward into the region. This same system will also be the culprit of severe weather in the Midwest. The lack of rain coupled with low humidity will serve as the ingredients for fire weather. Even though some areas received two to four inches with the past two weeks worth of storms, the wind has dried much of the area out. Winds can also play a factor as they can help spread the fire faster. The next chance of showers will be on Friday lasting through at least Sunday. Even though temperatures are expected to reach into the upper 80’s this week, the Mid-Atlantic states still need to get through Sunday night. The winds should diminish, and the clouds should clear, making conditions conducive for dew or frost. Because temperatures will drop into the 30’s, frost will be the likely visitor. For anyone who has already started their garden, make sure you either bring them in, or cover them so the frost won’t kill them. 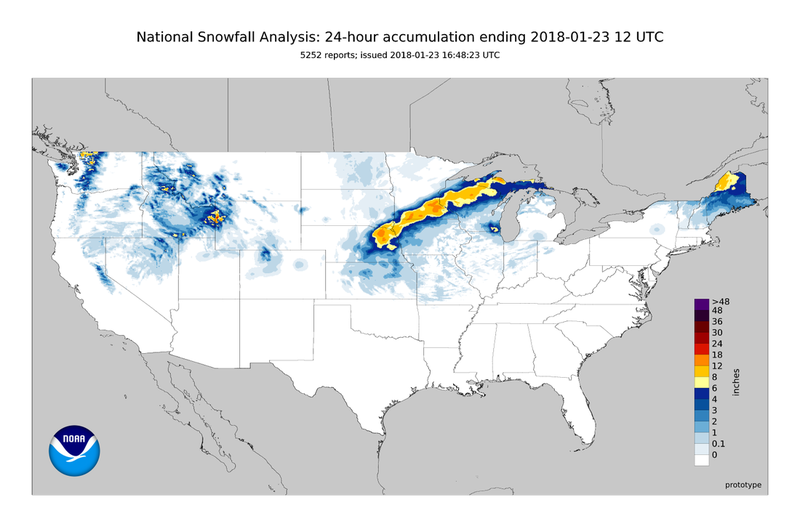 DISCUSSION: Over the past 24 to 48 hours, there has been an abundance of interesting weather events unfolding across the nation as we enter the first week of April 2018. 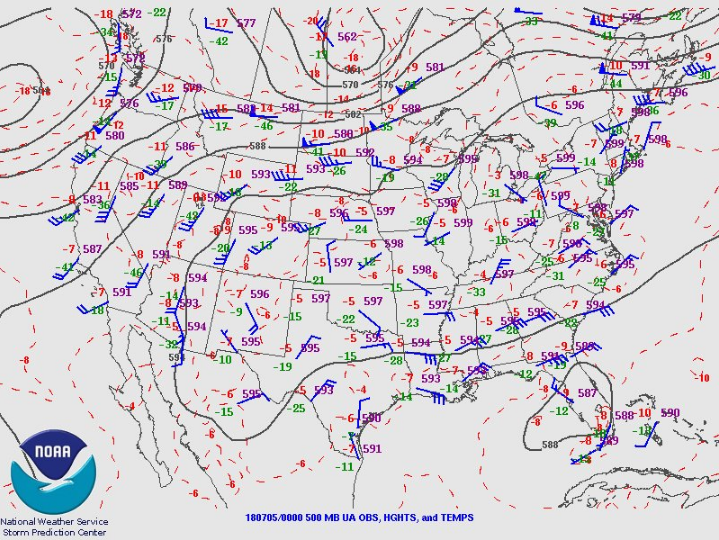 One such example of this interesting weather was a strong cold front moving southward quickly across the south-central Plains region of the United States. This particular cold front was caught "in the flesh" by way of the NOAA GOES-16 satellite imager in incredible resolution. Attached above is a neat video which contains animated low-level water vapor satellite imagery which captures the fluid movement of the cold front in incredibly high-resolution. Note how in the low-level water vapor satellite imagery shown above, you can even detect the presence of subtle cloud-based ripples and undulations in light of the approaching cold front. This is not all that uncommon with quickly-approaching cold fronts based on the fact that Spring-time cold fronts often pack quite a punch and bring a substantially strong return flow. Thus, when there is a strong return flow with the passage of a Spring-time cold front, there is often quite a show to be seen and the NOAA GOES-16 satellite imager is now allowing us to see this motion at a higher resolution than ever before. It is remarkable to view such high resolution satellite imagery since it allows atmospheric scientists to project corresponding initiation of frontal precipitation development as well as initiation of deeper, convective storms in some cases as well. Hence, it is very useful for weather forecasters to use such information for the advantage of improving the quality and accuracy of current and future weather forecasting. DISCUSSION: A low-pressure system first developing near the Rocky Mountains impacted the United States as it travelled in a northeast direction. A low-pressure system is a system associated with cloudy or stormy weather that has lower pressure in its center as opposed to the areas around it. In the Northern Hemisphere, winds spin in a counter-clockwise rotation around a low-pressure system. This particular low-pressure system slammed the Midwest with vast amounts of snow and ice before moving towards New England where it mostly deposited freezing rain. The largest impact from this storm occurred in the Plains and then spread into the Midwest. The winter storm dropped an impressive amount of ice and snow in its path. From 6 A.M. CST January 22 to 6 A.M. CST January 23, Prescott, Wisconsin and Winnebago, Minnesota respectively received 14.1 and 17.0 inches of snow. All of that within a 24-hour period! Pictured above is the total snowfall analysis from over this 24-hour period. From the color bar scale on the lower right-hand side, you can see that a significant amount of snow fell in these areas. The interesting fact about this storm is how it greatly impacted three separate regions across the United States. First, Idaho and Colorado were affected. Moving east, it seemed to drop the most amount of precipitation over the Midwest before finishing off in the northeastern tip of New England. Currently, the low-pressure system is moving away from New England, but still affecting certain areas. Maine experienced freezing rain with coatings up to a quarter inch of ice. It has recently switched over to moderate snow showers. Flood watches and warnings are also in effect for areas of Southern Maine, as well as Lancaster and York counties located in southeastern Pennsylvania. The center of the low is moving rapidly towards the Canadian Maritimes. Effects from this storm will diminish shortly-- if they have not done so already. To learn more about other interesting storms impacting North America, be sure to click here! DISCUSSION: Over the past several weeks there has been a substantial increase in the degree of national snowfall coverage. This is due in part to the fact that a number of different Colorado lows as well as Alberta Clipper systems have traversed across portions of the Central and North-Central United States. 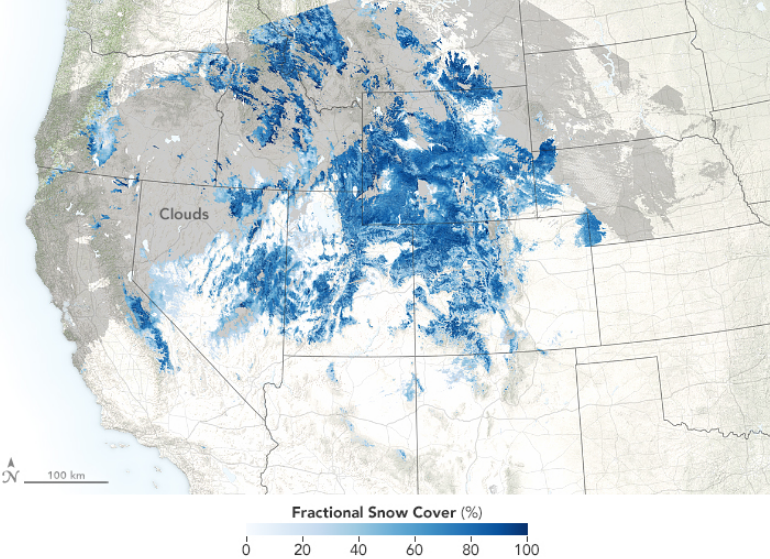 Hence, you can see how the inter-mountain portion of the Western United States was one of the first parts of the United States to receive a sizable amount of measurable snowfall. In addition, you will note how the Great Lakes region was one of the other regions to receive notable amounts of snowfall earlier on in the 2017-2018 Winter season. There is no question that orographic features spread across the United States are major influences on heavy snowfall potential. This is largely due to the fact that when air parcels are forced to rise up and over higher terrain, increasingly larger amounts of water vapor are forced out of corresponding air parcels. Thus, when greater amounts of water vapor are "squeezed" out of said air parcels, this greatly increased the localized potential for heavier precipitation events (i.e., heavier snowfall totals in the case of winter storm situations). 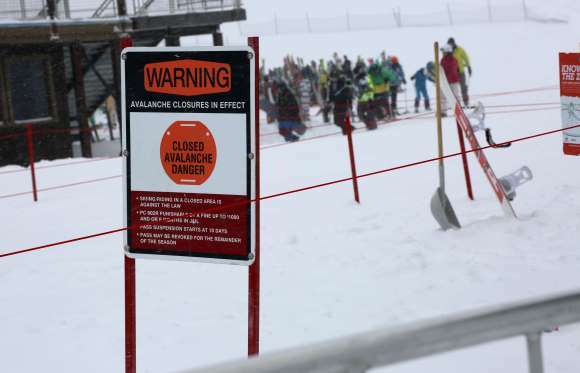 Hence, there is no debate that orography plays a pivotal role in facilitating greater potential for major snowfall events both across the United States and the world for that matter. ​DISCUSSION: A massive blast of cold air is currently hitting Florida bringing overnight low temperatures below 40 degrees Fahrenheit across much of the state. An exception to this is the southeast coast including Miami and Palm Beach which have overnight low temperatures in the 40s. The cause of the extreme cold temperatures to reach this far south is a massive ridge of high pressure across much of the Mississippi and Ohio River valleys as well as the very large low off the Atlantic Coast which is bringing heavy snow to the Northeast. There also is a heavy presence of sinking air which is pumping cold dry air down towards the ground which in addition to the cold air being advected at the surface is what is driving the temperatures to remain cold. 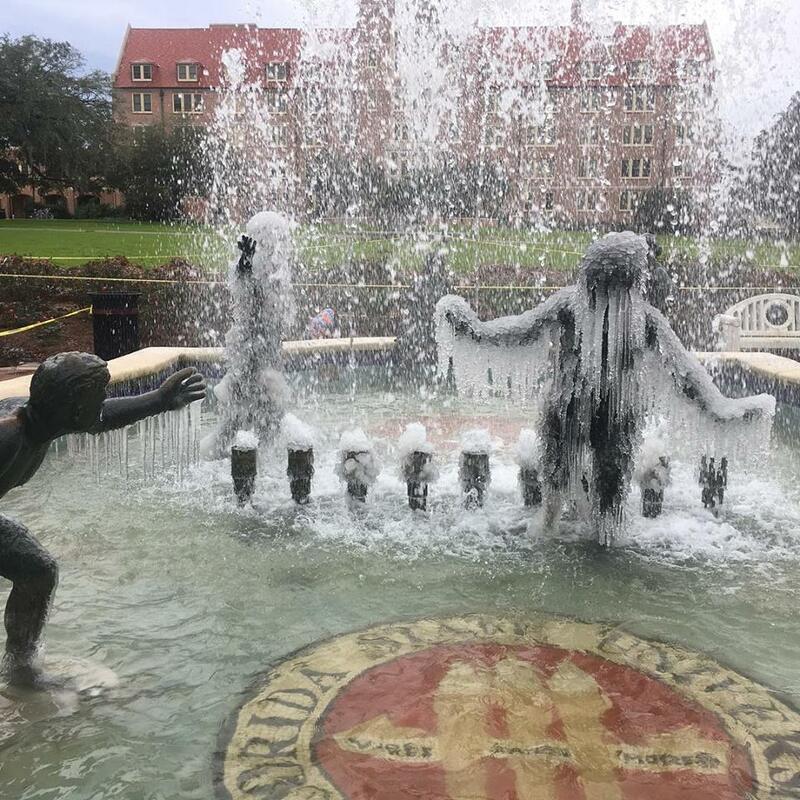 The cold air has also helped bring snow to parts of Florida including Tallahassee on Wednesday as the massive low was around the coast of Florida. The storm also brought above average precipitation values for much of the state (including over an inch of rain in Orlando). The below-average temperatures are expected to increase slightly through the weekend due to the ridge moving south as well as the massive low remaining over the Atlantic Coast which would increase a cold northerly flow. Many of the low temperatures recorded ranged from 12 to 18 degrees colder than average but were not record breaking by a few degrees. The cold air has caused unusual events to occur such as iguanas fell out of trees frozen as well as sea turtles to become inactive. In addition, airports including Orlando International have had to use de-icing trucks on many of the planes parked there. Citrus growers were on high alert as well, because of the possibility that the cold air will damage or destroy the citrus plants.